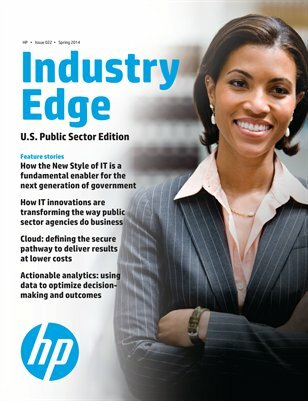 As one of the world’s largest technology companies, HP takes particular pride in delivering technology products, software, services and solutions to the public sector. Our customers are passionate about choosing partners that enable them to improve their ability to deliver accountable, cost-efficient, and citizen-centered services amidst budget constraints, rising expectations, and profound shifts in the technology industry. These shifts are being driven by trends such as cloud, mobility, big data, and security, and they are fundamentally changing the way technology is consumed, delivered, and paid for. They demand what we call a “New Style of IT,” which is a new style of business powered by IT.